Rafael Ruiz is the force behind the blog Travel & Lifestyle where he shares his opinions on travels and reviews different restaurants and bars he comes across all over the world. Rafael is based in Sydney, Australia so he also covers the events taking place around him. 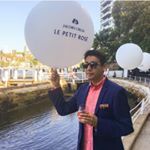 This is a complete lifestyle blog where you get to see different aspects of life from Rafael’s point of view but the absolute best thing is the way he integrates delicious food in his blog. If you’re a foodie who has a passion for life and a streak of adventure within you waiting to blossom then this is a blog to follow. Demographic data for @travel.lifestyleblog's audience is available for free to influence.co users.